A small celebration is in order. Today at the nursery we planted a tree, Platanus acerifolia ‘bloodgood’ the London Plane tree. A tree that nobody wanted. It was on sale for many seasons, no one bought it. It was moved to the 50% off section for a year. No one cared. It was a few twigs away from being recycled and turned into compost, but it spoke to us in tree-ish language. One which we rarely hear and less often understand. Today we listened and found it a new home. Out of the old 20 gallon pot it came, root-bound and squeezed. Into the ground it went, surrounded by enemies; poor soil, weeds and rocks. We dug the hole wide and tossed in nutrient mulch and good soil to amend the heavy clay. 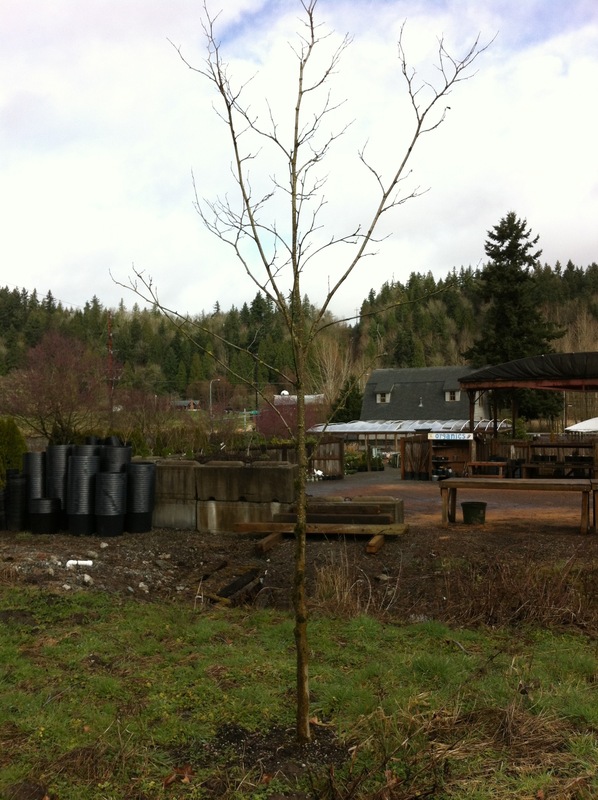 Luckily this tree is known to tolerate poor soil conditions—welcome to our garden! Around 12 feet tall, our London Plane tree had that naked winter look. Unassuming and transparent, yet with a natural grace. The branches moved upward and outward, and our imaginations did too. We looked at this minimal, unwanted tree and in our minds saw a sixty foot mature specimen, with maple-like leaves, shading the ground for picnicking and parties. Meet us under the London Plane tree in thirty years for the celebration! I love this blogpost! And I hate the barista who made me my decaf latte .. it was CLEARLY not decaf, given I am posting his at 12:40 AM. What clear imagery, I just want to curl up under it on those hot summer days at the nursery. Love your blog Elaine! Tiffany! I’m glad you checked out my blog. I would love to come out this spring and photograph and write about your community garden…talk to you soon!